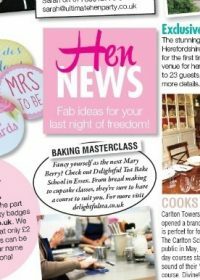 Wedding Ideas magazine July issue included our hen party service in their ‘Hen News’ section! 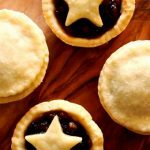 Our hen party packages are a great way to get together with friends, family and colleagues to enjoy a memorable baking experience to celebrate your forthcoming big day. We can also offer themed and bespoke parties for those of you who’d like to more of your own personality into your special event.You can find out all about what we can add to your pre-wedding plans by clicking here. Great place for Hen Party. I recently attended the bake school as part of my sister's hen day. We opted for the 'Cake Pop' making and was really good. It was ideal for our group as there was 6 of us. The place was immaculately clean and everything was laid out as we arrived. We were also provided with Champagne/Orange Juice/Tea/Coffee throughout and they even decorated the kitchen for us with a bunting and balloons that we provided. The whole afternoon was very professionally done and every stage fully explained and even when one of our party 'cake pop' started to fall off the stick they provided one of their own. At the end of the afternoon we were provided with a certificate which was a great idea and keepsake. I would definitely attend another class here in the future.